Chiyaan Vikram's Sketch, directed by Vijay Chandar, is in its post-production stages and the film's teaser and audio are expected to be released very soon. One of the songs in the movie, 'Achi Buchi Sketchu', was recently shot in an extensively grand manner. With more than 150 dancers and 1500 junior artists, this song was shot, with Vikram dancing for the moves choreographed by Dastagir. This is said to be a pucca energetic dance number. It can be recalled that the first single from the film, Kanave Kanave, composed by Thaman and sung by Vikram, has already become a chartbuster number. Actor Vikram’s next action comedy film directed by Vijay Chander is Sketch and is supposed to deal with car hacking as its premise. It has Tamannaah as the heroine and music by Thaman SS. We had reported that Sketch will not release anytime during Diwali 2017 and is said to be postponed to a later date. Sketch's post production work (Editing and DI) is supposed to be going on at the moment. Close sources reveal that 6 days of shoot that include a murder scene and patch work is still left to be shot. 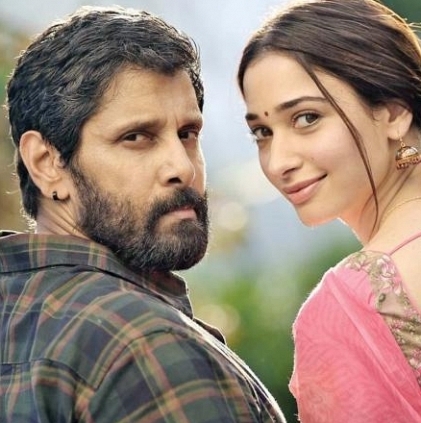 However, actor Vikram’s portions are said to be over completely. Is Ajith's next a political or space film? So what connects Vijay's Mersal to Dhoni's special knock today? People looking for online information on , Sketch, Vijay Chandar, Vikram will find this news story useful.